The Thrifty Guide to the American Revolution by Jonathan W. Stokes, illustrated by David Sossella. Viking, 2018, 137 pages. Suppose you’re walking along a sidewalk in Manhattan, minding your own business, when you happen to notice a book wedged under a drainpipe. Never one to pass up a book, you pick it up and discover that it’s a travel guide from . . . 2164! 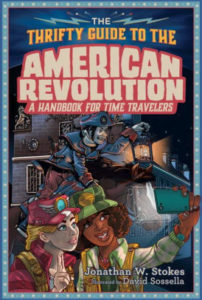 Some hapless time-traveler must have ended up in the wrong century, because this is a guide (in antiquated English type, with pages and all) to the American Revolution. It’s published by Time Corp, a future conglomerate headed by Finn Greenquill, who appears to be something of a megalomaniac (so we still have those in the 22nd century). I guess the Revolution seems far enough away that we can make jokes about it. There’s some good material: amazing British incompetence, Washington’s wooden teeth, flashy uniforms, goofy wigs, and all that. I doubt there will be a Thrifty Guide to World War I or II, and even the Civil War seems too close to home. Young readers should understand that the Revolution was as brutal and bloody as the Civil War, but on a much smaller scale and with a much happier outcome. Still, the David-and-Goliath odds against its success are appropriately noted here. Franklin and others gave full credit to Providence, even if the Thrifty Guide does not. For those anxious to try another era, the Thrifty Guide to Ancient Rome is now available, with Greece and the Middle Ages still to come. Thank Finn Greenquill! This sounds really good. And congrats on knowing about Cowpens! I live in Charlotte, NC, about 50 miles from Cowpens. 10 more points to you if you know about the Battle of King’s Mountain.